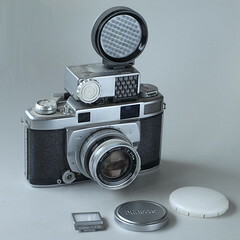 The Minolta Super A is an interchangeable lens 35mm rangefinder camera system introduced in March 1957. Image format was 24x36 on 135 film. The Super A featured a brightline finder with parallax correction and a unique button-and-lever-lock bayonet lens mount. Its behind-the-lens leaf shutter is a Seikosha-MX with speeds B, 1sec to 1/400sec, and M or X flash synchronization. The Super A system included an accessory shoe-mounted coupled selenium meter with separate selenium-cell amplifier, seven interchangeable lenses with accessory shoe-mounted finders for the wide angle and telephoto lenses. 3.5cm f3.5 Rokkor 35mm wide angle lens, with 4 elements in 3 groups. 5cm f1.8 Super Rokkor 50mm normal lens, with 6 elements in 5 groups. 5cm f2 Super Rokkor 50mm normal lens, 7 elements in 4 groups. 5cm f2.8 Super Rokkor 50mm normal lens, 5 elements in 3 groups. 8.5cm f2.8 Super Rokkor 85mm portrait lens, with 5 elements. 10cm f3.8 Tele Rokkor 100mm short telephoto lens. 13.5cm f4.5 Tele Rokkor 135mm telephoto lens, with 4 elements. ↑ JCII/Lewis, ed. "The History of Japanese Cameras" p195. ↑ Cooper, "The Minolta Manual" 1959, pp77-88. ↑ See also Minolta 35 regarding Leica-thread-mount 'Super Rokkor' lenses.